My four-year-old daughter, being an arty-crafty type, loves the CBeebies character Mister Maker, so we were very excited to go together to see ‘Mister Maker & The Shapes Live!’ at the Orchard Theatre in Dartford. I was not sure what to expect from the show – surely Mister Maker can’t do only ‘making’ for the duration of the show? I needn’t have worried – the show was a fantastic mix of craft challenges, singing, dancing and audience participation. A clever mix of live performance, video and use of a camera to get up-close to the crafty action made it interesting for kids and adults alike. Mister Maker, aka Phil Gallagher, is full of boundless energy and charisma and from the moment he appeared on stage, arty-crafty-girl was mesmerised. He created a fun and lively atmosphere, encouraging participation from all the kids in the audience, and the adults too. His silly humour for the kids and more subtle jokes-for-the-grown-ups kept us entertained throughout. 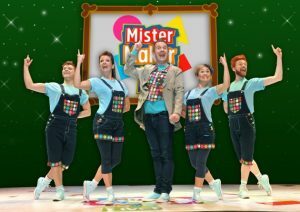 Mister Maker was supported by four perky singer-dancers, performing bouncy choreography, who worked brilliantly as a team to keep the energy up during and between the different sections of the show. They helped us learn dance moves and songs, and assisted Mister Maker in the exciting ‘minute makes’. The highlight for arty-crafty-girl was, of course, The Shapes! Bright colours and silly voices, along with the familiar TV theme tune, made their appearance a highlight of the show. The front of house staff were warm and approachable – be prepared, however, to bring cash for the merchandise – art packs, soft toy Shapes and glowing spinners are all too enticing for the kids. Arty-crafty-girl was so delighted with the show, she asked to do some ‘making’ as soon as she got home – and that’s something I’m delighted with. If you liked this review you may also like my review of Matilda, Annie and School of Rock.